These are some of the dialogues between Our Lady and Juan Diego, taken from written narrations inspired by the account of Indian scholar Antonio Valeriano around the middle of the 16th century. In the first apparition, Our Lady addressed Juan Diego, speaking in the Mexican idiom: “Juanito, my son, the humblest of my children, where are you going?" "Noble lady, I go to the church in Tlatelolco to listen to such divine matters as our priests teach us," he replied. She said, “Know for certain, dearest of my sons, that I am the perfect and ever-Virgin Mary, Mother of the true God, the Lord of all things and Master of Heaven and Earth. I ardently desire a temple to be built here, where I will show and offer all my love, compassion, help, and protection to the people and those who look for me. I am your merciful Mother, the Mother of all who live in this land and of all mankind. I will hear the weeping and sorrows of those who love me, cry to me, and have confidence in me, and I will give them consolation and relief. 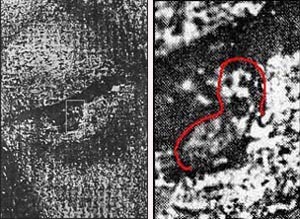 Above, an enlarged view of the right eye of Our Lady of Guadalupe shows the face and shoulders of a man, who appears to be Juan Diego. 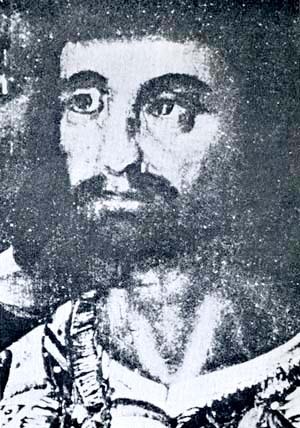 Below, a picture of Juan Diego from an early painting. 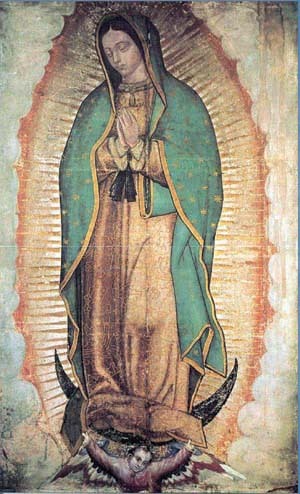 The third apparition: The Holy Virgin insisted that she wanted Juan Diego to give her message to the Bishop. He did so, and this time the Indian returned to Our Lady saying that the Bishop had asked for a sign to prove that what he said was true. The fourth apparition: The next day, instead of going to the hilltop, Juan Diego took a different route that bypassed it to find a priest for his uncle who was gravely ill. Juan Diego was certain that Our Lady would not see him. She then told him that he should not worry about the sickness of his uncle, for he would not die at this time and that, in fact, he was already cured. Calling herself Holy Mary of Guadalupe, she told Juan Diego to go up the nearby hilltop where he would find flowers aplenty, even though it was winter. He found Castilian roses and gathered many and placed them in his tilma, a long cloak used by Mexican Indians. He came back to the Virgin, who rearranged them and commanded him to go to the Bishop without opening it until he was in the Prelate’s presence. After a long wait and much difficulty getting past the servants of the palace, Juan Diego finally stood before the Bishop. He unfolded his tilma, and the roses fell out. 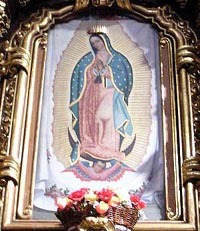 The Bishop and his attendants fell on his knees before him, for a life-size figure of the Holy Virgin was printed on the poor tilma of Juan Diego. It was December 12, 1531. There are many aspects of these apparitions that have often been the subject of commentaries: that Our Lady chooses simple and pure souls to speak to mankind, that she is pleased to appear to humble peasants, that she challenges the human respect of her emissaries, etc. I think that these are good points, but they have already been stressed. An aspect that receives less attention that I believe is very interesting is the attitude of the Indian Juan Diego before Our Lady and the language he used to address her. His manner and language have an extraordinary tonus that corresponds to Our Lady’s attitude toward him from the beginning of the apparition. Our Lady treated him as a dearly loved son, with an extraordinary kindness, as if he were a child. There is a marvelous contrast we can see in the general conduct of Our Lady. On one hand, there is the love she has for great souls, the heroic souls who accomplish great things in the lives of peoples and civilizations; on the other hand there is the love she has for small, simple souls entirely turned toward her and forgetful of their own virtue. It is marvelous to see how she speaks to these small souls with love and a particularly touching tenderness. The attitude of Juan Diego is also interesting. He is a simple man, without any education, but in his simplicity he addresses Our Lady as a truly courteous man. He greets her, he inquires about her well being, he describes how he executed the mission he received as if he were a real diplomat, and he explains to Our Lady the practical cause for his failure. He had presented himself in the Bishop’s palace to transmit the message of Our Lady and was treated disdainfully by the servants and valets of the palace. So he reasoned thus: If I were a noble and powerful man, I would be well received and my message would have more credibility. He thought he was doing a good thing by giving this counsel to Our Lady: You should choose someone important to deliver your message; then the Bishop will receive him well and everything will go as you have asked. One sees in him the humble desire to not appear or shine and also, to a certain measure, his desire to avoid trouble. So in his charming simplicity he gave her that advice. There are many qualities in this response, but here I want to stress his tact. He gives her a fine diplomatic counsel to resolve the situation. He also closes his suggestion in a courteous way: My Lady, I beg you not to be displeased with me. It was not my intention to anger or irritate you. That is to say, he found a good way to excuse himself while presenting his suggestion. He is a simple peasant, but we can see a certain nobility in this attitude. One can also see that Our Lady liked the way he presented his idea. She probably smiled kindly at his diplomatic advice, but she did not accept it. On the contrary, she asked that he return to speak with the Bishop. 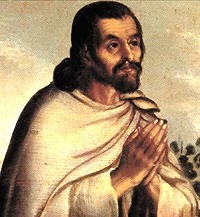 It seems that Juan Diego was willing, but found that he needed to postpone the task. His uncle was sick and seemed close to death, so he went to find a priest for him. He thought that Our Lady could wait until the next day. But she caught him on the different route he took to avoid her. Then she not only cured his uncle, but worked the miracle the Bishop had demanded. So finally, with that miracle, the apparition of Our Lady was approved by the Bishop. There is a lesson for us in this episode: Wherever true virtue exists, courtesy and noble manners develop as a consequence of it. The opposite is also true: When virtue is no longer present, courtesy and nobility of manners disappear. Juan Diego was from a very simple social level; notwithstanding, he acted as a noble when he dealt with Our Lady. The Catholic courtesy that bloomed in Europe was, at base, a daughter of the virtue that society practiced in the Middle Ages. When this virtue died away and the Revolution started to be accepted by society, courtesy lost its root and began to move toward the complete brutality of manners that exists in Communist countries or the blatant vulgarity that prevails in the Western countries that adhered to egalitarianism.